Today has left me feeling all kinds of annoyed. Firstly, the morning came too soon again. It’s been happening more and more. You know, someone stealing those precious dreamy hours away from me. It’s some kind of elaborate scheme so someone else can siphon off hours for their own pleasure, only I’m just too dumb to catch them in the act. One day I’ll catch them and then I’ll be able to sleep 12 hours a day AND do my job. I’ve vowed never to return to that bike shop. I’ve been going to this shop religiously since I bought my bike there a few years ago. They were always super helpful, did little jobs with no charge and didn’t lie about how much things were going to cost. I trusted them. The staff have changed and maybe the management too. Not only was I royally shafted (for the second time), but I was insulted again….when I went to collect I was asked IF I knew what kind of bike it is. Firstly, they should damned well know from my name which bike it is and secondly, clearly as I’ve got two x chromosomes I am supposed to shrug my shoulders or giggle and say a pink one with a wicker basket. Unimpressed face ensued, and I was prompted as to whether I knew the make…the delay was not because I didn’t know, I was angry…its a women’s Scott sports hybrid bike. I almost told him the model and frame size but he wouldn’t have got my point. I’m actually unhappy with BOTH of the brakes, I do not think that they have been set up properly and I will have to fix them myself, as I should have done in the first place. As for the last visit there where they messed up my lock while fixing a pannier rack and I had to fix it myself because the boy working there was trying to permanently fix the lock to the bike….and I was charged labour for that! Can you imagine! And the kid just looked at me like, oh yeah I’ve just spent loads of time watching you fix that up and time is money. The rack was overpriced anyway. Grrr. Never again. Ok that’s enough venting of anger. There is more, but I can’t write about it so I’ll just bend someone’s ear in 3D. Oh woeful woe is me. What cruel fate must plunge me into so dreary and unrelenting a day! I awoke to the twin sensations of a belly full of eels, and a skull full of angry fighting pufferfish. I knew right then that I was set for a good’un. I was meant to read a student’s report this weekend. I forgot. At 8:30am when I went to my work bag, there it sat, all pristine and unencumbered with strings of red ink. A great sigh ensued, and maybe a little groan of despondency. I cycled to the bike shop who proceeded to tell me not only that the job would cost 3 x what I expected, but also that women never use the back brake. Oh really? And just as I took a run up to get on my super high feminist horse, I realised that in my case, yes that is probably true, so I merely raised a single eyebrow, evoking no response from the bike fixer upper. The nice guy who used to do my bike fixing left apparently, so not only would I be ripped off and belittled, I would also have to either leave work around 4pm or get my damned bike tomorrow morning. That other mechanic used to stay until 6:30pm for me to collect. I don’t much like change. And so onto the nauseo-bus wenteth I, complete with reading material. The reading sadly extended beyond the journey, into the lab and infringed most horribly on my toast and marmite break. I did a lot of sighing and exclaiming. It was deserved. One of my colleagues ran the wrong samples for me, so I have a less than perfect dataset. Gah! I colour coded the damned tubes and specified what colour needed analysis….In his defense, I think he might have an aversion to yellow and I certainly don’t blame him for that. Thing is, I remember seeing him with the blue ones and I never clicked that they were the backups. Doh! I’ve got the next draft of that student’s report to read again (well I couldn’t make myself read the whole thing this morning) and I just want to sleep but I haven’t yet mastered scrawling in red ink while unconscious, but if I do, you’ll be the first to know. 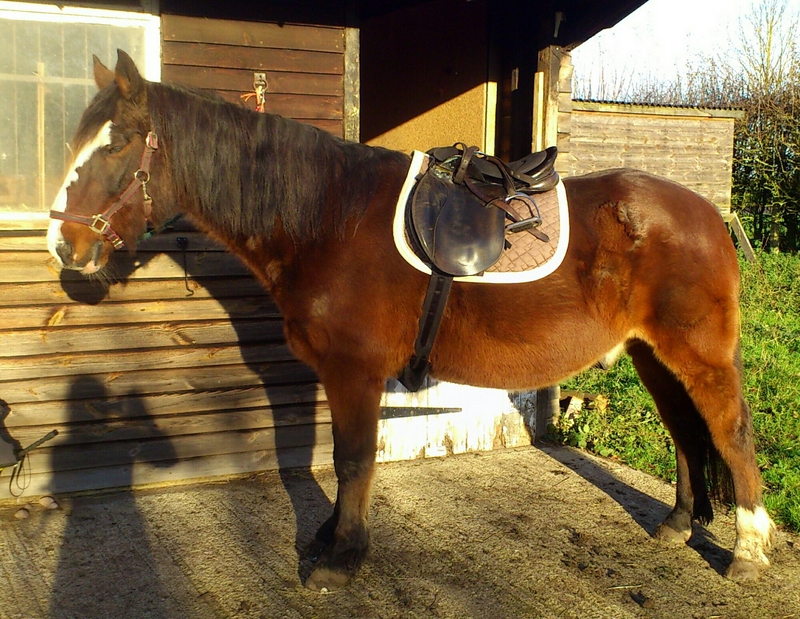 Here is my 15’2 buddy Buster, striking his best show horse pose in the winter sun. The shadow is, of course, me. We had a really great ride together, I togged the pair of us up in hi-vis gear and we charged off to terrorise the local deer population. Those 4 that we always see hanging around calmly didn’t know what apocalyptic events were unfolding as we cantered towards them! I have to add that because I was expecting a trippy horse and therefore imminent ejection onto the ground, I sat really deep and kept my heels down and I’m pretty sure we would have aced a dressage test with that pace but those pesky deer ran straight in front of our path, ruining the concentration of all and drawing our attention to the shooters who were approaching from the left. Now, we are fairly sure we have permussion to ride this stubble field, but just in case figured we’d exit the land before we were intercepted….or, yknow…shot. I also had fun with the farm cats. One who was originally homed here on account of he was too feral to be picked up, attacked me for cuddles. I must have bent forward a trifle from standing and the damned noisy beast jumped right into my unexpectant arms and proceeded to purr loudly at me and do laps of my neck! Don’t get me wrong, he’s super cute and excellent at correcting my feline diction for me but I have genuine concern about the cleanliness of claws that go hunting rabbits all day long. That aside he’s the most friendly cat ever so I have no idea what they do to animals at rehoming centres but it can’t be that good..
I’m finally going to take my bike in to be fixed. I thought I could do without the rear brake but apparently not. I stopped to pick up something that a cyclist dropped, peddled over to them, hauled on the brake and sailed way on past. Oh the shame. The downside to bikefixedness, however, is that I’ll have to take the bus to work until they’ve fixed it and will consequently most likely be in a foul and paranoid mood all day. So I look forward to that.